In 1834 Friedrich August von Alberti recognized three distinctive formations in southern Germany. These are the Bunter (lower), Muschelkalk (middle) and Keuper (upper) formations, which he grouped into the Trias, and today this is called the Triassic System. The old term Trias is often used in Europe, even by English-speaking geologists. The Muschelchalk or "mussel limestone" contains many fossils of marine organisms. The Triassic Period is the first geological period of the Mesozoic era or "Age of Reptiles". It was during this time that Archosauromorph "ruling") reptiles achieved dominance on land, and many types of marine reptiles flourished in the seas. Image: graphic from Naturmuseum Senckenberg (Centre for Biodiversity Research). The Triassic saw the single vast supercontinent of Pangea straddling the equator. This was shaped rather like a giant "pac man". Where the mouth is the Tethys sea. All around Pangea was a huge ocean, Panthalassia. Yet Pangea had no sooner formed then it began tearing apart, with rift valleys developing between North America and the African portion of Gondwanaland. Large crustal blocks subside, creating physiographic basins. The Tethys Sea intrudes into Pangea from the east, leading to the division between Laurasia in the north and Gondwana in the south. The climate was warm but for the most part dry, and the middle of Pangea was very arid. An older system is still widely used for the Early Triassic, referred to as the Scythian. In this system, the first age of the Triassic is the Griebachian, which is probably somewhat longer than the Induan. The Oleneckian is divided into the Nammalian(which is subdivided into Dienerian and Smithian) and the Spathian Ages. Triassic land plants included a diverse assortment of plants characteristic of the "Mesophyta" ("middle flora" - from Late Permian to Middle Cretaceous). The great lycopod and cordaite trees of the Carboniferous and Permian were long gone, although smaller lycopods survived. Calamites-like forms were however still important, perhaps fulfilling the ecological role of bamboo today, with Neocalamites reaching fifteen meters in height. 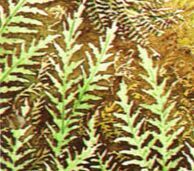 Ferns also continued to flourish, and dominated Triassic floras. The great coal swamp lycopods, sphenopsids, and tree-ferns, which reproduced by spores and hence required moist habitats, didn't do too well in the dry Triassic climate. The drier climate - especially the arid interior - encouraged the evergreen conifers and other gymnosperms, which reproduced by exposed seeds and wind pollination. These include conifers (including many modern families), pteridosperms (such as Dicrodium, above), cycads, Bennettiales, and ginkgos [Gastaldo 1997]. Xeromorphic (dry adapted) characteristics were common, such as scale-leaved conifers and thick-cuticled pteridosperms and cycads [Behrensmeyer et al 1992 p.330]. Moister conditions meant plant life was more abundant in the coastal regions [McGowan iNet]. There were also several main biotic provinces, determined perhaps by climatic factors. The Laurasian Flora is made up of; a mixture of primitive conifers - Voltziaceae and Lebachiaceae - along with cycads, bennettitales, ginkgos (especially in northern latitudes), ground and tree ferns, and sphenopsids. .The conifers and ginkgos seem to have been medium-sized to large trees that formed diffuse canopies. Different types of animals are associated with each floral type. In the south, therapsids like sheep-sized herbivorous Traversodonts predominated; in the north, archosaurs were more common. As regards the history of life on Earth, the Triassic period was significant for a number of reasons. This was a time of transition, in which many old forms of life died out, and new, and sometimes even modern, ones appeared. The fusilinid foraminifers, lacy bryozoans, rugose corals and trilobites that had characterized the late Paleozoic all disappeared. Bivalves, ammonoids and brachiopods all recovered from the Permian extinction to dominate the Triassic. In the case of the brachiopods, Spirifid, Terebratulid, and Rhynchonellids are all well represented. Ammonoids include a huge number of families with ceratitic suture lines, these all evolved from a single lineage that survived the end-Permian extinction event. So diverse are these ammonoids that the Triassic could easily be called the age of Ceratites. In addition to the ceratites, other forms with more complex (ammonitic) suture patterns appear for the first time. The ammonoids are also joined by new groups of coloeids or squid-like forms, including the Belemnites, a group that was to become abundant during the Jurassic.. Most modern groups of invertebrates also appeared during the Triassic. A number of new orders of echinoderms (starfish, sea urchins and their relatives) evolve, although echinoids remain rare and of specialized types. Modern scleractinian corals appear, and in the equatorial Tethyean regions form small patch reefs no more than a meter high and often build on the decaying remains of sponge reefs. There are no massive reefs like those that exist today. There are very little remains of phytoplanktonic. It is likely that the phytoplanktonic of the time were - soft-bodied forms, and hence they were not preserved as fossils. Insects included many modern orders, as well as several extinct lineages. Little is known of other terrestrial groups of arthropods, but since they are known from both the Paleozoic and the later Mesozoic they must have been present. Illustration from The Cambridge Encyclopedia of Life Sciences, ed. Adrian Friday & David S. Ingram, © Cambridge University Press 1985..
During this time, aided perhaps by better adaptation to arid environments, the ectothermic ("cold-blooded") archosauromorphs attained prominence over the endothermic ("warm-blooded") Therapsids or "mammal-like reptiles". Some of these archosauromorphs belonged to the Prolacertiformes, Archosauriformes, Trilophosauridae, and Rhynchosauria These basal archosauromorphs and archosaurs were a diverse group, that included several semi-aquatic crocodile-like forms (Proterosuchidae, Proterochampsidae, Phytosauridae), early lumbering semi-aquatic carnivores (Erythosuchidae), more advanced and active large terrestrial carnivores (Prestosuchidae, Ornithosuchidae, Poposauridae, and Raiusuchidae), small, active bipedal forms, armoured herbivores (aetosaurs), lightly built quadrupeds that were ironically related to true crocodiles, and many more. Towards the end of the Triassic, several new and more advanced archosaur groups evolved from the earlier forms. These were the dinosaurs and the pterosaurs (which were closely related), and the small terrestrial sphenosuchian Crocodylomorpha, the "greyhounds" of the reptile world. There were also many types of small lizard-like non-archosaurian reptiles like Younginiformes and Paliguanids, but little is known of them. The procolophonids - stubby herbivorous lizards, were also very common. The rivers, ponds and lakes were populated by large temnospondyls, of which the Capitosauria were frequently one or two meters in length (the great Mastodonsaurus may have reached four or five meters), and Ceratodan lungfish were also common. In the seas were an unprecedented diversity of marine reptiles - the dolphin-like ichthyosaurs, the lizard-like pachypleurosaurs and thalattosaurs, the long-necked seal-like nothosaurs, walrus-like placodonts, the turtle-like henodonts, and the long-necked Pistosaurs. Most of these animals were seriously diminished by the end-Carnian extinction event (possibly caused by an extraterrestrial impact - a comet or asteroid). New forms of animal life evolved to take their place, or suddenly came into dominance after millions of years of obscurity. These included the archosaurian dinosaurs, pterosaurs "flying reptiles"), and proto-crocodiles. Various forms of lizard-like diapsids (non-archosaurian reptiles) also appeared - choristoderes, and Eolacertians (including the gliding Kheunosaurs) and Sphenodonta, along with the first tortoises. Following the extinction of many therapsids and parareptiles at the end of the Permian, new dynasties of synapsids arose. These included more advanced therapsids such a the cynodonts. Cynodonts had always been a minor group during the Permian, but they now diversified to a great degree. The dicynodonts were represented for the most part by a single family of large forms. 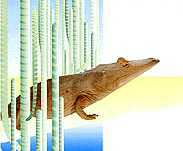 The cynodonts were of small to moderate in size. The largest types (such as Cynognathus) only occurred during the earlier Triassic, although several large herbivore types (traversodontids like Exaeretodon, see illustration above) appeared later. They were distinguished by a number of mammalian traits. By the Late Triassic they had given rise to the mammals, although one family, the Tritylodontidae, were to continue right through to the Early Cretaceous. The first true mammals also appeared at the end of the very end of the period. The mammals were to remain insignificant throughout the whole of the Mesozoic era and only come into their own after the extinction of the dinosaurs. The ancestors of small familiar animals like frogs and possibly also lizards also first appear at this time. In a number of papers [Lucas 1998, Lucas 1999 ], Dr Spencer Lucas and coworkers present a Triassic tetrapod biochronology, in terms of common global faunas. (During the Triassic, the existence of a single landmass enabled most animals to wander very widely). This incorporates earlier biochronologies based on the South African (Karoo), West and East European Argentinean, Chinese, and North American sequences. The series is as follows. early Carnian? (or latest Ladinian) Chanarian note another LVF between the Berdyankian and Otischalkian? Norian Revueltian LVF Typothorax, Aetosaurus, Pseudopalatus, Nicrosaurus, Mystriosuchus. 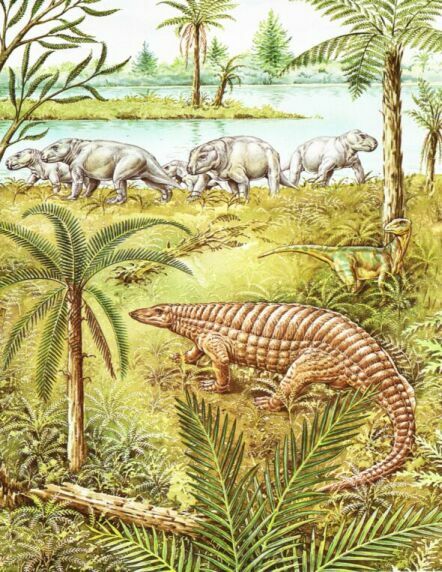 earlier late Carnian (early Tuvalian) Otischalkian Paleorhinus, Angistorhinus, Longosuchus (= Lucasuchus, "Stagonolepis" meadi), Metoposaurus, Doswellia. Early or Middle Anisian Perovkan LVF Eryosuchus, Eocyclotosaurus, Shansiodon, Scalenodon, Parakannemeyeria, Sinokannemeyeria, Kannemeyeria simocephalus. Late Olenekian / Early Anisian Nonesian LVF Parotosuchus, Trematosuchus, Erythrosuchus, Cynognathus, Diademodon, Trirachodon, Kannemeyeria cristarhynchus.